This camp was bigger than I had planned, but it proved to be very enjoyable. The enthusiasm of campers, parent support and feedback was incredible. Seventy-six girls, ages 7 to 14, attended the camp which was held on July 22, 2015 at Our Lady of the Lake University's Softball Complex. As usual, Coach Kling, OLLU Softball, was a great host. Camp assistant coaches were Ashley Hinojosa, Michelle Uribe, Jessica Idrogo, Maricela Bissaro, Taylor Doege, and Richelle Morales (see bios). Special thanks to FBA students who came by to help: Kate Corley (St. Mary's University signee) and Aliyah Pritchett (Southwest HS Class of 2019). 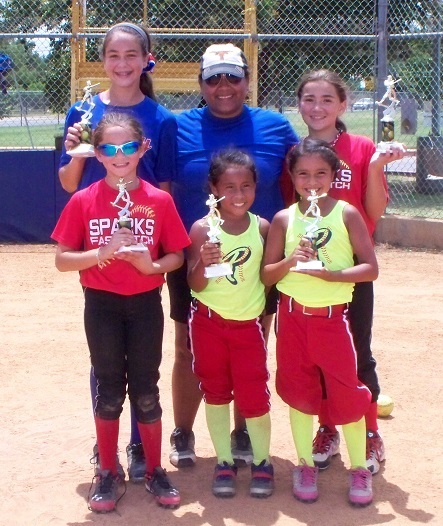 Special recognition goes to the following young ladies who got Outstanding Camper honors: Sophia McMurray, Isabella Renteria, Ava Renteria, Leena Garcia, and Adalyn "Chip" Mayorga.